The Amazon order came yesterday with my new challenge: "Encouraging the Heart" by Kouzes & Posner. This will be put on my 2011 goal sheet for work to complete along with the "Leadership Challenge" book written by the same authors. I am so enthralled with the Leadership book, so I searched for other things that might go along with it, only emphasizing some specific strengths - and there it was! Thinking I'd rather work at becoming really good at one thing than mediocre at many. 2011 has and will be a year full of challenges and pushing myself to be a better person and employee. I haven't seen this movie, but the trailer is just a wonderful reminder - I AM. I came across this in a couple of places this morning, one of them being Etsy. The photo itself comes from Flickr. I think everyone's refrigerator door should have this as it's main adornment. 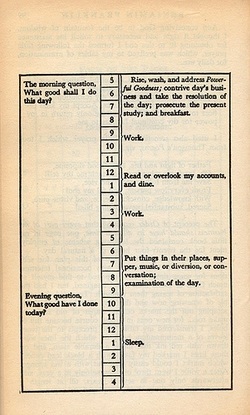 What good are you planning on doing today? Yes, I stole this photo off of Facebook, but I had to. These people are over the top in so many ways. 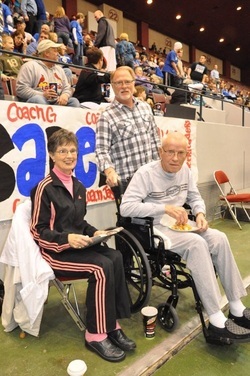 The gentleman you see in a wheelchair was and IS an inspiration to our whole family. He believed in our son, Tyler, from early on. He saw the potential, the drive, the spirit. He urged him on, encouraged him, loved him. Tyler had nothing but adoration and respect for him. This picture was taken today at the Lincoln Christian High School game during the Nebraska State Boys Basketball Tournament here in Lincoln. May blessings pour upon this entire family for their faithfulness to our youth. Tom and Pat - you are two of God's most faithful. Thank you. There are always times of questioning things...... like direction, doing the right thing, is it worth it..... You know, those kinds of things. I had a few questions about some of my motivations yesterday but never fear, God put something into my view every time I was in the car. 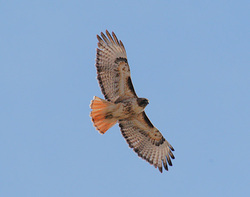 Yes, I was given four hawk sightings yesterday - a true blessing. I've hung on to these sightings for 7 years. They give me hope, they boost my confidence and help me to continue on in my pursuits. I just know these are my personal gift from God and I am forever grateful for his constant love and guidance - every EVERY day. Inside of all of us, there is a tiny warrior. Not the destructive image we've seen on TV and in movies but a positive force that goes to battle every day to get us through challenges in our careers, in our lives, and within ourselves.To light the fires of success, you first need a spark. No matter how good the excuse, it cannot justify a broken commitment. Mistakes happen. You must forgive yourself, learn the lessons and move on. The impact of your actions is often far-reaching and unknown. It may affect many others. You can only create and control your life path one day at a time. You will be rewarded and judged by actions, not intentions. It is never too late to keep a promise to yourself. The Tiny Warrior was written by-D.J Eagle Bear Vanas is a nationally acclaimed motivational speaker who uses traditional warrior concepts to break through the barriers to high performance. D. J. owns Native Discover, Inc., a company dedicated to improving lives and "building the warriors of tomorrow ....today." Without reiterating my life's saga and the highs and lows we call 'experience', there is yet more new hope on the horizon. My dear 'Uno Orb' (as one of his client's calls him) may have the chance to expand his territory of sales. If anyone can do this, he can. He's motivated, he's excellent at what he does, and I truly believe that God is blessing him for his perseverance through all that he's been through. Talk about someone who's been through more ups and downs than a teeter-totter, I truly believe that this offer of advancement will be finalized within the next two weeks to someone who has truly EARNED this opportunity! The opportunity itself is overwhelmingly wonderful. Where you can find inspiration, gratitude and thanksgiving for everyday life and experiences.